I'm taking a short break and expect to post again on Sunday, December 4. 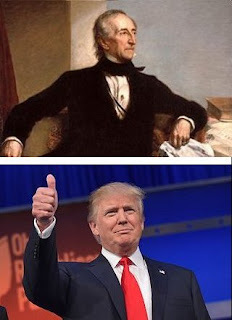 Is President Trump the reincarnation of President Tyler? Many commentators are saying that the election of Donald Trump, a novice who has never held political office, to the presidency of the United States is unprecedented. There have been others who went directly to the White House without first having held other elective office. But the only ones I can think of were previously generals and war heroes; among them were Zachary Taylor, Ulysses S. Grant and Dwight D. Eisenhower. Tyler & Trump: More alike than different? The presidential comparison that strikes me as most apt, however, is between Donald Trump and the nation's 10th president, John Tyler. Like Tyler, Trump's party affiliation changed over time. Trump had given most of his political contributions--prior to his presidential run in 2012--to Democrats before joining the Republican Party and running in the 2012 presidential primaries. Tyler was a Democrat who defected to the Whig Party and eventually ended up on the Whig ticket as vice president in 1840 with presidential victor William Henry Harrison. The campaign was famous for the phrase "Tippecanoe and Tyler, too." Harrison died within one month of entering office elevating Tyler to the presidency. Tyler rejected the Whig platform and vetoed many of the bills his party sent him. Trump has yet to take office, but we already know that he and Congressional Republicans do not agree on Trump's $1 trillion infrastructure spending proposal, his desire to build a wall along the U.S.-Mexican border, or his stand against existing and pending trade agreements. On the other hand, Democrats are already trying to forge an alliance with Trump on infrastructure spending and trade. Many Americans are frightened by the idea of Donald Trump as the country's new pilot-in-chief, fearing he'll crash the airliner of state (including climate and environmental policies) into a mountain or the ground. Clinton, they argued, for all her flaws, knows how to fly this thing called a country using the federal government and at least won't end up crashing it. But my metaphor assumes that every American believes he or she is on the same plane. And, that understanding is what seems to have clouded the minds of so many when thinking about the U.S. presidential campaign this year. For those living in America's small towns and rural areas and for those in the downwardly mobile working class, their plane has already crashed! These groups are now dazed and wandering around in the wreckage trying to figure out how to live from day to day. It is no wonder that such voters were immune to cries that Trump would crash the country. The business-as-usual globalism that they believed Hillary Clinton represented seemed to them like it would only make things worse. Both Donald Trump and Democratic primary contender Bernie Sanders told these disaffected groups that a big part of the reason their communities and livelihoods crashed was a set of trade agreements that essentially shipped their jobs overseas. That made sense to them, and for a time they had two competing champions. But only Donald Trump made it to the general election. I always advise candidates with whom I consult to find something to which they can say "no" and to say "no" to it often. I am neither being perverse nor merely negative. I am being realistic. The most powerful word in politics is "no." It is a testament to the power of "no" that a U.S. presidential candidate 1) who is a billionaire and reality TV star, 2) who has never held elective office, 3) who appears to have very little policy knowledge, 4) who has inveighed against the threat of all Muslims and immigrants in general, 5) who has demonstrated distasteful and dismissive conduct toward women, 6) who has bankrupted companies he controlled several times, 7) who has called his opponent a crook with frequency, 8) who has run an underfunded and disastrously disorganized, undisciplined campaign, 9) who has demonstrated a thin skin through narcissistic fits of anger during live television debates and 10) who claims publicly that the election has been rigged to prevent him from winning--that candidate, Donald Trump, is running neck and neck in the polls with an establishment candidate, Hillary Clinton, who has virtually every advantage. If I had read you the above list of 10 items a year ago describing a presidential nominee for a major party and told you that that candidate would be virtually tied with his establishment opponent right before the election, you and most everyone within earshot would have had a good laugh. But here we are.